Is the market bullish or bearish? What is the state of the debt market? How are the latest government policies going to influence pension schemes? The financial services business deals with varied issues and relies heavily on technology to stay updated and ahead of the market in spotting trends and making accurate predictions. Insurance sector - We enable insurance companies to stay connected with customers, clients, agents and partners with highly functional applications. We also help them with managing sensitive data and administration issues. Other financial institutions - Whether you are an independent broker or an agency, we can create portal solutions that will enable you to track the markets and manage client accounts. 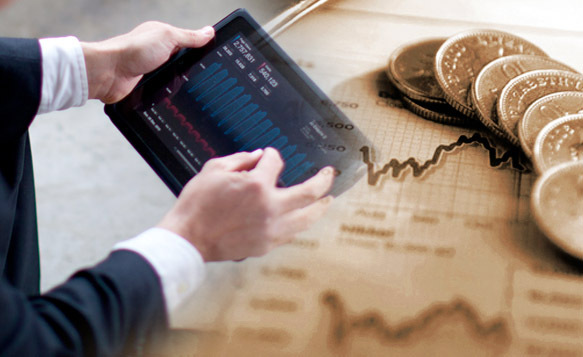 We can deliver solutions that will enable you to display the latest financial services that the customer can benefit from and also calculate returns. We support, financial service businesses with IT solutions that are related to the industry and to the business. Our low cost solutions are a result of our careful manoeuvring of the open source development platforms. We ensure that security does not get breached at any level so that critical information remains secure and accessible.